Minute Maid Refresh Products in 20 oz Bottles. 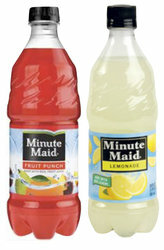 Our most popular Minute Maid Refresh products available to you in 20 oz bottles. Several flavors to choose from, mix and match for maximum refreshment. Minute Maid Refresh Products in 20 oz Bottles.